Have you played any of the similar games like dwarf fortess, adom or caves of quid. Is so care to compare and contrast ? Up to chapter three in Shining Force the original, tossed the bird guys aside and plowing on with my minimal squaddies. I try not to do a lot of grinding, but since I don't use mages and only four characters, I do have to spend a little extra time on a few maps to boost a level or three. No, i found out about Dwarf Fortress pretty late, Rimworld was already out and it seemed to fit me better (graphically). Just started State of Decay 2. Early observation says its just more of the same with better graphics. I'm in the similar boat lol. I've been sleeping late because of this game!!! In my recent post about ESO I forgot to add the most important thing: the writing is very good, even all side-quests are well thought-out. It's one of those rare story-heavy MMORPGs like SWTOR and LOTRO. Which is the only type of MMOs I play. I keep getting updates on Rimworld, but every time I check it out it still seems to be stuck in early access. 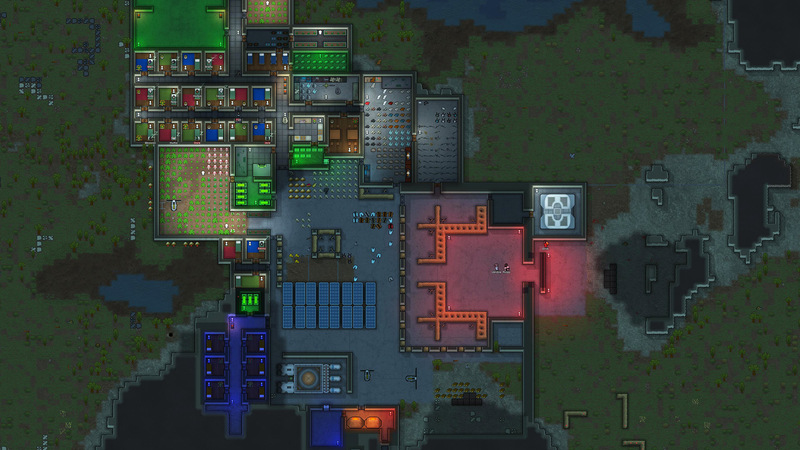 "RimWorld is a top-down construction and management simulation computer game currently being developed by Ludeon Studios." Not my thing. Sounds too much like work. I always thought rimworld was more like prison architect than the cult game dwarf fortress (better tile sets are available btw ). Aren't they from the same developer? I haven't finished yet because I rerolled and am currently playing a mixed party as a halfling fighter/thief, but.. I will say one thing I love about BG is how it handles your companions. They're so much more interesting and realistic because they're not talking your ear off about their personal life philosophy or their horrifically edgy and tragic past. It's less lazy, even though a modern character probably has a lot more time and effort put into it. I remember loving the companions too in bg2 and being blown away by all the extra interactions they had, but unfortunately I think modern rpgs have taken a cool thing and killed it. I really dislike how companions are handled in modern games - they're more clearly a facsimile of people and ideas and they're just.. boring that way. I feel like a lot of companions and rpgs nowadays are "over written" and developers have forgotten that less is more. It is at 1.0, though in so called "unstable version" meaning the dev is constantly updating it (like every day).. i've noticed 1 bug so far, but there are probably plenty i haven't noticed. @Thrasher the graphics are very clear and simple for a reason, you quickly scan around the game world to see what's going on, if there was too much info in the graphics it would be slower and boring to play i think. I'd describe the gameplay and especially the "story" as very organic, so many laugh out loud things can happen. It does remind me somewhat of the old days of pen and paper RPG's, but with a virtual game master. I'm a huge fan of randomness though, and there's a lot of that here. I do wish the game was a little less lazy or generic when it comes to certain things, like animals and manhunt packs, why can't they be something a bit more interesting, i mean you're on a new planet.. It feels like he pointed randomly in a book about animals and then decided "yeah, whatever, let's have squirrels and foxes and…"
I guess there's some kind of charm in there for people who played it since start "it's supposed to be like that, its how i remember it! It's funny!". But i wish he'd have someone who has a bit more feeling for art direction etc. I do like some of it, but the generic animals i could be without. They should be randomly generated too imo, looks and names of species. My cat pet is named Joy and my Laborador is Desiree. @vurt personally, I love animals and think their avarta is cute so I have no issues. But yes, it would be interesting if there are also unique/random amimals besides boomerat and boomerlope. No, it's not from the same devs. I really should play Prison Architect, another game i've had in my library for years now heh..
Would be interesting to try Dwarf Fortress too actually. Yea andromeda was fun shooter but it did get repetitive after a while (the chatter is well done but after a zillion times of repeating the same thing frequently it also gets old). The story was decent but there was a lot missing. I think it was under-rated but it was not the best game - don't take me wrong I would say it was very decent and it had some interesting ideas. True, I didn't mean to convey it is an excellent game. It is just very decent and I'm loving certain aspects of it. Fortunately, it doesnt feel repetitive yet, thanks to the different worlds. I'm at elaard (or something) now, enjoying the sun and (waterless) beaches. I dislike the vault quests the most so far, pretty boring design and I dont really like the blocky art. The Jaal dude chatter is quite interesting, almost funny. I also don't like roguelikes or procedurally generated content much, so that's another reason for me to stay away from Rimworld. Now that Battletech supports my native resolution and they've fixed it up, I've finally started playing it. It's really good and enjoyable. A little rough and clunky in some places - but it has the exact feel I was hoping for, which is to say it's a great modern iteration of MechForce. Beyond that, as usual, I'm dabbling in a variety of games. Also playing Destiny 2 with my brother - and it's nice streamlined dumb fun. All I remember is you listening to paid journalists' advertisment articles and went for SLI although everyone and their mother here told you to stick with one strong card.